Through my own attempts to study Arabic in-country in my undergraduate years I became aware of a shocking lack of support for Australian students interested in studying in the Arab world. While opportunities for students wishing to study abroad in North America, Europe and increasingly East Asia, are vast, not one Australian university offers students the chance to spend a semester or more on the ground in an Arabic speaking country. While some, such as the Australian National University, do offer short periods of intensive study in between semesters, none have exchange programs or any support programs enabling the long term immersion necessary to gain high levels of competency in Arabic. Australia lags far behind the developed world in this regard. Dozens of European and American universities have study programs with both public and private institutions in Egypt, Jordan, Lebanon, Oman and Kuwait. Australian students are noticeably thin on the ground in the region in comparison to other foreign students. In Jordan it was more common to run into Australian diplomats and military personnel receiving exorbitantly priced private training than students seeking immersion in the region. 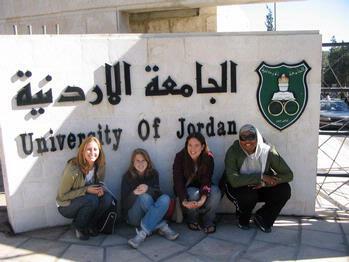 Foreign Students at the University of Jordan Language Centre represent nations from all corners of the world. Unfortunately Australians are rare. Arabic is one of the more difficult foreign languages you could choose, and given the ever increasing focus on the region and its links to Australia, there is a greater need than ever for specialist knowledge of its cultural and political intricacies. Including West Asia and the Middle East in the Department of Foreign Affairs’ ‘New Colombo Plan’ would dramatically advance the opportunities for students of the Middle East at the same time as developing key skills in national security and trade that the government is currently seeking. It seems Universities are unwilling to take any initiative in more challenging and less profitable study environments.